From 14th to 19th of May you can come from Sardinia by ferry boat with very advantageous prices and discounts till -30%. Call the Booking Centre 199.400.500 specifying you’re going to take part at the 29a Biker Fest. Payments only by Credit Card. In the last editions this area has been very appreciated. This year some local dealers and also Triumph Italia will attend at the event offering a static exhibition of the new model and Demo Rides. Also historic Italian brands will take part at the event to show their wonderful accessories which improve appearance and functionality of motorcycles! It’s no coincidence that Biker Fest reminds and celebrates the 45th anniversary of the most famous movie in the world of the Biker-Custom-Hippy scene. It was 1969 when Peter Fonda, Dennis Hopper with the participation of Jack Nicholson realized and performed with a very small budget the milestone of the World Biker Movement explaining the anger and the bother of a whole generation. This is a movie very loved by organizers who lived in first person that psychedelic period. Ever faithful to the slogan “Rally-Race-Rock Festival” at the Biker Fest there will be about a dozen of live concerts. Follows the artists on the web site. In the public stadium G.Teghil many Factories will offer Demo Rides (free test runs) and will present all news for 2014. Speaking about motorcycle tours Biker Fest has always dedicated a great attention to this aspect inspiring a lot of the initiatives proposed by many regions in Italy and by many organizations. Very interesting are the Motorcycle Tours organized and looked after by the organizers to let know to all guests the magnificence of the Region Friuli Venezia Giulia. 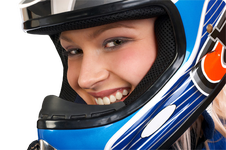 Culture, history and foodstuffs are the main proposals offered by Motoclub and Association. The most historical and classic meeting of American cars in Italy was born at the start of Nineties. LITTLE TRAIN, LIMOUSINE, TAXI & ENOGASTRONOMIA! To give the possibility to eat and drink without problem there will be a little train, some Limousine and numerous taxies that will connect the 3 areas of the event with Camping and Hotels. In the Luna Park area you’ll find local gastronomic specialties at very low prices. Airbrushers, pinstripers, bodypainters, engravers... ready to paint tanks, color bodies, cut metals and battle to win the first prize in the Custom Painting Show. Subscriptions are open! To enable you to attend the event, accommodation facilities in Lignano Sabbiadoro put at your disposal the best hotels, apartments and villas with garden at discount prices! Book now, pay no fees and you do not need credit card!